After that rough road trip where the Pats went 1-5 and slipped down to fourth place in the TBL standings, the Patroons have rebounded with two straight wins over the cellar-dwelling New York Court Kings, who might only get to the playoffs if someone buys them tickets. So yeah, Chuck is happy. A lot of great action on the court, a lot of thrilling plays. But it all depends on which gamer you’re watching. So there’s the deal. 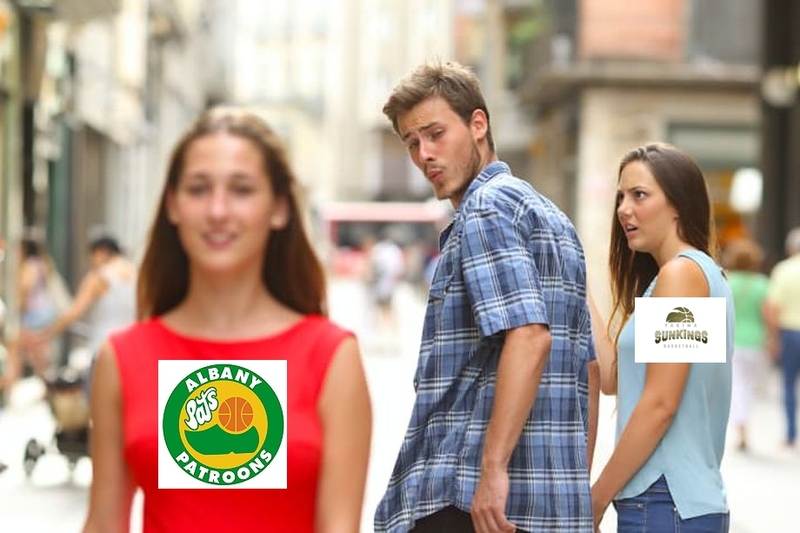 There are two Albany Patroons games being played tonight – the one we’re all watching, and the one that Tim Wilkin of the Times Union is watching. Because Tim Wilkin watches a Patroons game and he searches for everything wrong that he can find. And that anti-Patroons bias that he’s had – going back to the 1990’s – is still evident today. So let’s follow along with the Patroons game – both what we’re watching and what Wilkin sees on his Twitter feed. What we see – this is a rivalry game, where the Patroons need to take another victory over the Court Kings to stay in the hunt for a playoff position. One of the refs just walked into the Armory, saw Patroons coach Derrick Rowland. “Are they here yet?” he said referring to tonight’s opponents, the New York Court Kings. “Not yet,” said Derrick. “Are they coming?” asked the ref. And here we go. What we see – this is the first game after Edwin Ubiles set a Patroons franchise record for most points scored in a game, with 55 total. In the first quarter, Steven Cunningham scored two major slams to bring the crowd to life. Extremely exciting. What we see – 3-pointers from way downtown by Lloyd Johnson and from Shea Bromirski, along with a very intimidating presence from Alonzo Murphy. At the end of the first half, Albany has a nice 63-54 lead in a thrilling game over the Court Kings. That’s what we see. For Tim Wilkin, it’s like advertising a root canal. In the end, the Patroons take another big win, 127-100. The Yakima Sun Kings are on their way to the Armory for that classic rivalry between the Patroons and the Sun Kings that dates back to 1990. Edwin Ubiles finishes the game with 33 points, giving him 88 points in a two-game stretch. Steven Cunningham has four major rim-rocking hammer-slams. Darius Paul plays like a champion, with 25 points and 7 boards. Oh well … if nothing else, the Patroons are back in the speed of things, and Yakima’s on its way. And trust me, here’s how I see that game.